Many people fail to recognize the very first symptoms of periodontal disease. Sometimes you may put off a serious warning sign and assume that it will go away when you brush and floss your teeth more regularly. For instance, bad breath and bleeding gums, which are key issues in family dentistry, are considered normal since most people use over the counter mouth washes and tooth pastes to simply make it go away. What they don’t know is that they could be addressing a symptom instead of dealing with the underlying condition once and for all. Sometimes the symptoms of periodontal diseases are more prominent due to lifestyle choices like smoking. Smokers will often experience bad breath, bleeding gums and discoloration that comes and goes away with time. If not treated by a dentist Richmond Hill, the individual may experience serious periodontal disease that becomes harder to treat when ignored for too long. Most people will have gingivitis as a first sign of periodontal disease. Gingivitis, a major dental problem in general dentistry, is commonly identified by inflammation of the gums. It is a bacterial infection whose symptoms may often come and go for long periods of time. 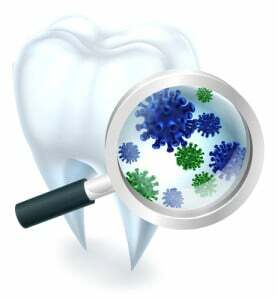 If the infection goes untreated, the condition can quickly spread to the rest of the mouth leading to periodontitis. Persistent inflammation: Tooth inflammation is caused by bacteria that enters the gums and continues to penetrate with time. Light swelling is normal and usually goes away with time. However, if the inflammation goes on for long and begins to minimize gum tissue breakdown. This may lead to significant bone loss and if untreated, it can lead to tooth loss. Bad breath: This is one of the most common signs of gum disease. This is common among those who don’t floss regularly. Plaque collects in between the teeth causing bad breath and gum inflammation. Redness of gums: When you have a gum infection, there’s a high likelihood that you will notice redness of the gum tissues. When left untreated, this can cause the gums to recede especially for those with thin gum tissues. Sensitivity of gum tissue: If you notice sensitivity of gum tissue whenever you brush your teeth, it could be a sign of gum disease. The exposed roots, especially if you have receding gums, may experience sensitivity whenever you take hot or cold drinks and foods. Looseness of tooth: Gum disease can also cause ligament damage that results in tooth looseness, movement and migration. This ultimately causes tooth loss. Pain and soreness: When the periodontal disease has become acute, it may result in pain and soreness. You may even notice some abscess, pus in the area and excessive bone loss. At this point, you really need to visit your local dental office Richmond Hill and have the gum disease treated immediately. Note that gum disease may have no recognizable warning signs. It’s important to have regular dental checkups just to be sure that your teeth and gums are healthy. Never wait until it’s too late. You may save a lot of time and your teeth in the process.